Halima Akhtar is an exceptional student who gained an A* for both Edexcel A Level Fine Art (100% at AS and A2) and A Level Textiles (100% for AS and A2 Coursework projects and 98% for both examinations). This article features her AS and A2 Textiles projects, completed while studying at Woldingham School, Caterham, Surrey, United Kingdom. Halima gained an A Level Art Scholarship and went on to gain a Distinction for her Art Foundation year. Halima’s sketchbooks contain rich, mixed media pieces, sculptural exploration, fabric investigations, manipulation of materials and experiments with stitching, surface and pattern. 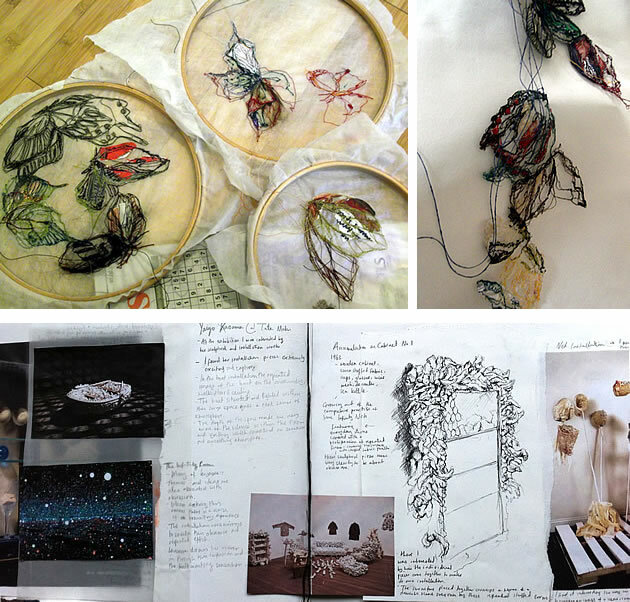 A journey that begins with first-hand observation and ends with complex, three-dimensional pieces, Halima’s AS and A2 Textiles projects are superb exemplars for others: some of the best A Level Textile sketchbooks that I have seen. We were lucky enough to interview Halima about her projects. Her responses about first-hand observation and how she approached her themes are particularly valuable. It is important for high school Art projects to work from first-hand observation and respond to the world around them. It is sometimes unclear how this applies to a Textiles project. Please explain how you were influenced and inspired by first-hand observation. Halima: Coming from an Art background at GCSE when I approached my first AS Textiles project ‘Growth and Decay’ I felt it was important to use the skills I had learnt, which included drawing and painting from first-hand resources to record visual information. This way of working has fed itself through my textiles and art to this day. Through my A Level Textiles course I was able to embrace the notion that textiles has much more to offer than making clothes; it is about working with materials and surfaces sculpturally to discover endless possibilities to explore. With the title ‘Growth and Decay’, the main thing that struck me was the concept that fungi grows as a process of decay and degeneration. I went looking around forests and outdoor areas to find examples of fungi in the natural setting. The tremendous scale, smell and slime that I often saw growing around these forms – observations I could not have made through photographs – inspired my work greatly as I experimented with material qualities. Within my ‘Armour’ project (see further below), I also drew a connection with natural forms and insects, where some of the repetitive and layered protective shapes were similar in these two entirely separate structures. 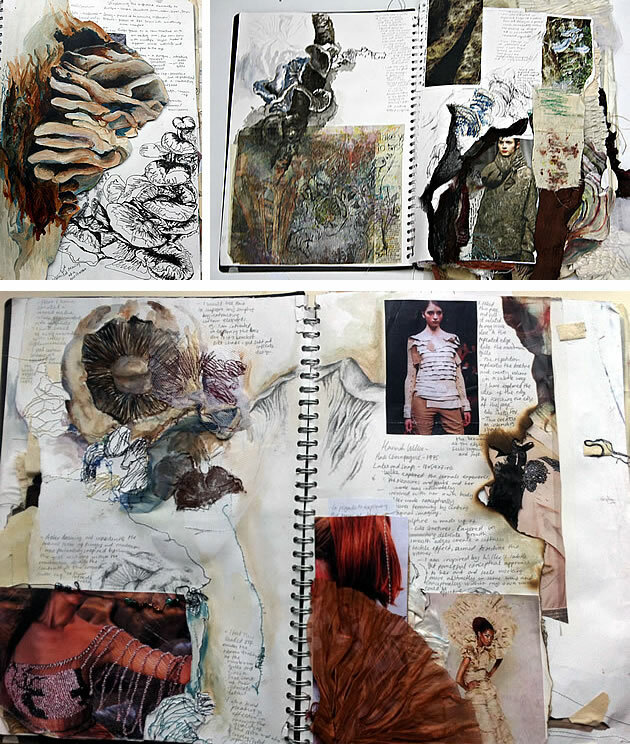 With sketchbook pages that are filled with rich, mixed media exploration (ideas continually feeding from one work to the next) Halima’s AS Level Textiles portfolio develops coherently towards her final piece. The enlarged details of the AS Textiles final piece illustrate Halima’s high level of craftsmanship; the skilful manipulation of media and careful integration of shape, texture, surface and colour. Working with undulating stitched and torn paper, organic forms emerge from painted and drawn marks; fabric is cut, slashed, folded and moulded into shapes that are born from the mushrooms analysed in the early phase of the project. I feel one of the main reasons that I was able to explore so much in my A Level Art and Textile projects was that not only did I actively take a part in searching for this first-hand experience, but I enjoyed it as part of the natural process of making. The records that I made in drawings and notes also became important references for later. Halima’s AS Textiles Exam begins with competent observational drawings of first-hand sources: organic and manmade forms that link to her Armoury and Structure theme. As with her AS Coursework project, the pages include confident use of a wide range of mixed media. The idea of working from first-hand resources doesn’t need to be limited to subjects to draw from. Within my work, observing and taking note of processes and the way in which things happen every day helped to widen my perspective. I believe there is a beauty in taking something ordinary and often unnoticed and being able to comment on it, transforming it to make it important and notable. In this section of her AS Textiles exam project, Halima explores stitching and surface qualities of fabric samples in more detail, continually pushing boundaries and being inventive with textile elements. She continues to develop ideas using drawing and painting, creatively morphing from one medium to the next. Some students lose enthusiasm towards the end of their project; Halima’s AS Level Textiles project becomes even more vibrant and comprehensive as she nears her final piece. Gaining inspiration from a range of relevant artists and designers, she continues to produce fresh, innovative pieces that integrate cohesively with her body of work. 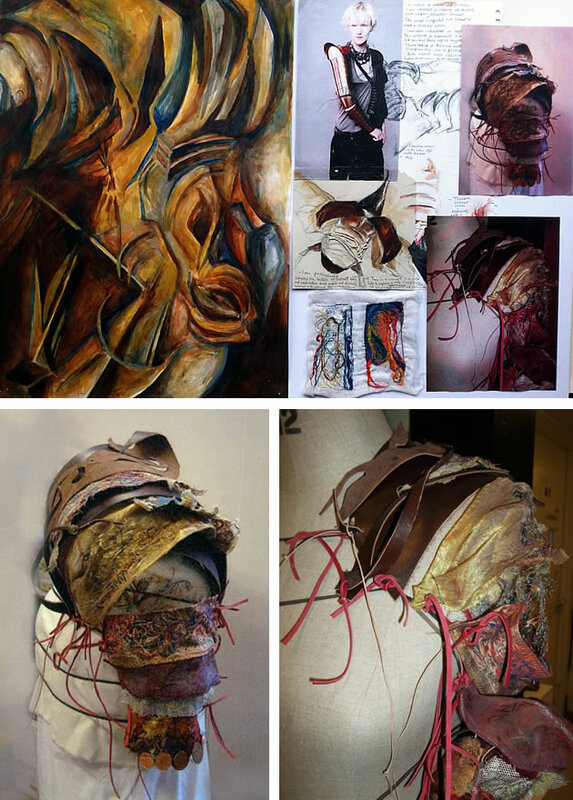 Halima’s final AS exam piece brings together a range of textile techniques in an outstanding sculptural interpretation of ‘armour’. As I moved on to the second year of the A Level Textiles course, my observations of first-hand resources underpinned my practical work and the exhaustive reflection necessary within my Coursework contextual essay. I was primarily interested in the sequential process of metamorphosis in butterflies and in order to understand this I purchased a small butterfly hatching kit. The insects came in a pot and I observed closely their cocooning, hatching and release. The inspiration I gained from this experience was invaluable. It was breathtaking to see such intricacy and awe in something that happens every single day. The cocooning concept provided the basis for my project, as I was fascinated by this idea of a container with connotations of entrapment and protection. I reflected on how I, too, containing these animals in an artificial setting, had meddled with the boundary between appreciation and being harmful. This brought about the idea of ‘collecting’ within my research and pushed me to develop more conceptual and meaningful ideas in my work. The commonalities and contradictions in placing these two issues alongside each other was interesting and I was able to use the imagery of the metamorphosis and insect infestation to convey the concepts of compulsive hoarding in a creative way, initially unexpected to even myself. Halima’s A Level Coursework project begins with first-hand observation of butterflies and hatching cocoons. Often deemed an overdone, ‘pretty’ subject matter, butterflies in this case are approached in a way that is original and exciting, resulting in rich, layered, mixed media sketchbook pages. Your work uses a beautiful array of mixed media. Please talk to us about the materials and mediums you used and why you selected these. Halima: The observations I made in my drawings led organically to textile samples, For example, using wadding to make trappings conveys the quality of translucency and the idea of entrapment that I observed in the compacted wings of the butterfly folded within the cocoon. On reflection, much of my work and drawings strive from a place within me where I am trying to understand or describe, through marks, a certain texture or form. This is obvious in my AS Textiles Coursework project, ‘Growth and Decay’, where my sketchbook is filled with material tests and drawings in different media, such as paint, ink, pastel, stitching, string and fineliner. When working from the inspiration of fungi, the qualities within the form influenced the mediums and marks I chose. In my experiments – and then my final piece – I used different colours of felt melted together within a sandwich of cling film and then free machine stitched over to create a simple line drawing. I wanted to evoke a tactile moss-like quality that was alluring, despite being inspired by the slimy, almost repulsive texture of the fungi. 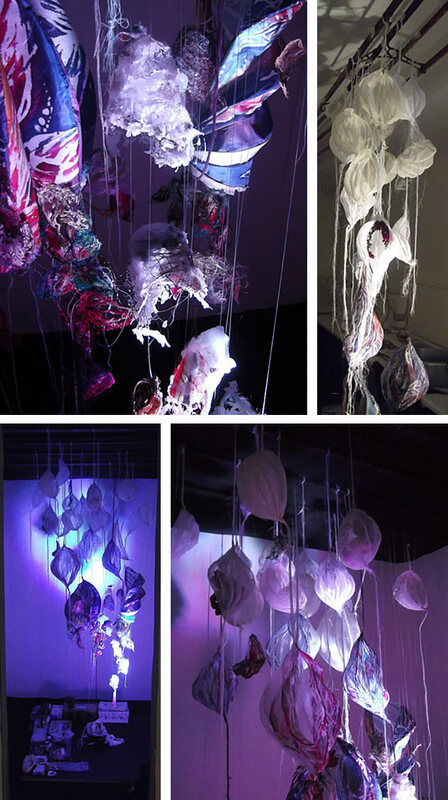 For me, there is something compelling about taking textile methods and processes and subverting their functional purpose or worth in more fine art pieces, such as installations or 3D mixed media drawings. Within a fine art setting there can be an unspoken rule of distance between a viewer and the work: with my textile pieces I am really trying to challenge and evoke this desire to connect through touch. Viewed at a larger scale, this sketchbook pages gives you a sense of the power of Halima’s work; the gutsy mark-making and raw layering of mediums. My material sampling developed from basic introductions to processes to those that I discovered on my own. Experimenting with processes and combining different materials through simple actions often provided me with more insightful concepts to push further. I am fascinated by the idea that in each cut, stitch, tear or mark the viewer sees the maker manifested physically. It is incredible how the mind leads the hands and body to create something entirely new. Looking at the work of others with this perspective, an understanding of textiles is universal, as we all are capable of using our hands and challenging the ways we do this. This is why I am drawn to mixed media, as it requires so much workmanship and this attention is visible at the immediate surface. In my work I always try to convey something fluid; a regeneration or degeneration of materials. I feel there is honesty in materials that are in a state of disrepair or ruin. They reflect a journey and the idea of a coming apart. With my Decay final piece, there is an organic growth and undulation of the 3D textile elements emerging from the drawing and painted marks. The elements of stitched and torn paper that give texture to the drawing help to create an illusion of different 2D and 3D levels. The textile components of the piece are made up of three main techniques. As I researched the concept of degeneration, I began to think about status. This led me to consider Tudor garments and how they convey excess, worth and importance. Interestingly, I discovered a Tudor slashing process, in which clothes are layered and the top material is cut to reveal even more layers of luxury. This emergence interested me and I was drawn to the idea of combining levels of different material qualities. I also incorporated different sized Suffolk puffs which were very quick and easy to make and produce multiples for the scale I desired. The main part of the textile extension of this drawing was made up of many cup-shaped pieces. I found a netted mesh-like material which held the form of a shape when wet and moulded around it. I was able to fold the fabric around the cup and secure with a rubber band, creating pleats that were inspired by the frilled ‘gill’ on the underneath of the mushrooms. As I researched armour I saw traditional metal suits and shields, but also discovered ancient Middle Eastern armoury and weapons. The irony is that weapons and objects that featured within ancient battlefields – places of such irreprehensible damage – were so beautiful and skilfully crafted. I was inspired by the beauty and strength and wanted to explore these ideas of mixing hard and soft. I began creating panels out of free machine-stitched patterns on muslin and then wired them to give shape around the arm. I also experimented using patterns in a more subtle way, polyprinting onto brown leather. I created the print by softly drawing into a piece of polystyrene and then printing the negative image. The leather was a compelling material to me, as not only was it strong and felt authentic as an ethnic armoury, but it also suggested the idea of a skin. When I looked at the exoskeleton of the beetles and scorpions I was fascinated by having an armoury as a second skin. For my A2 Textiles Coursework, I looked at cocoons and the idea of collecting and hoarding. My ideas and sampling led me to consider making an installation piece. I wanted to create containers to represent the cocoon shells that were to become vessels for collected objects that were important and therefore safeguarded and protected. With this in mind, the techniques that I used to make pods were very careful and time consuming. With a Japanese pattern cutting book Pattern Magic by Tomoko Nakamichi (Amazon affiliate link) my peers and I experimented with the shape called the ‘Jabara’. I had never done any pattern cutting before, however I wanted to challenge myself and found, with time, I picked it up. I found these forms to be elegant and delicate when made in translucent and soft organdies and silks. These luxurious materials and the care the vessels took to create symbolised the attention a collector takes in preserving items of worth. With these pods I wanted to evoke a sense of accumulation, as occurs with the process of obsessive hoarding, where items with value are lost beneath the rubble of everyday rubbish. I decided to tie the delicate, finely constructed pods with more expressive and messy containers crafted from the collected materials themselves. With the collections becoming the materials, the cocoons are left hollow, just as the collector is left feeling empty emotionally after becoming consumed by these meaningless scraps. To create these more exciting and tactile pieces, I began dying materials using batik to create negative resist images of fragmented wing patterns. I also stitched these butterfly patterns onto a vanishing plastic material, so that when completed the fabric dissolved with water, leaving the fragile skeletal stitched drawing. Further development of ideas in Halima’s A2 Coursework project: the intricate stitching and sculpting of form. Which artists / designers did you study as part of your project? How have these influenced and shaped your work? Halima: As part of the process of generating textiles, I continually collect visual information, especially inspiration from other artists or designers. I think it is also important not to limit the sources in which inspiration or ideas can come. Because I also studied Fine Art, I drew ideas from sculptors, painters or installations, as well as textile and fashion work. One of the key examples of how seeing other designer’s works in person can affect or inspire work greatly was with my Growth and Decay project. I saw the Future Beauty: 30 Years of Japanese Fashion exhibition, which featured work from designers such as Issey Miyake, Koji Tatsuno and Junya Watanabe. Despite there not being any immediate connection with my work, I absorbed as many influences as I could. Within the exhibition, the pieces featured a clean and simple elegance and aesthetic. There were very prominent sculptural qualities in the way the designers addressed the body and created shape and form. I was particularly fascinated by the curled undulating textures within a dress made from wired mesh and the honeycomb structures in skirts. These fluid forms resonated with me and I began looking at simple materials in new ways. I found very small paper cups and began cutting and twisting them around each other to respond to the shapes I had seen. As I reflected on my work, this gave direction to my final piece, where I experimented with different ways to create the cup form and, through multiples, convey a sense of growing decay. 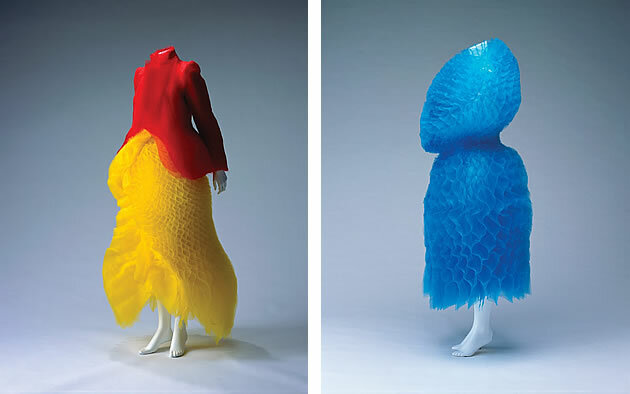 Work by Junya Watanabe from the ‘Future Beauty: 30 Years of Japanese Fashion’ exhibition (photos by Takashi Hatakeyama). 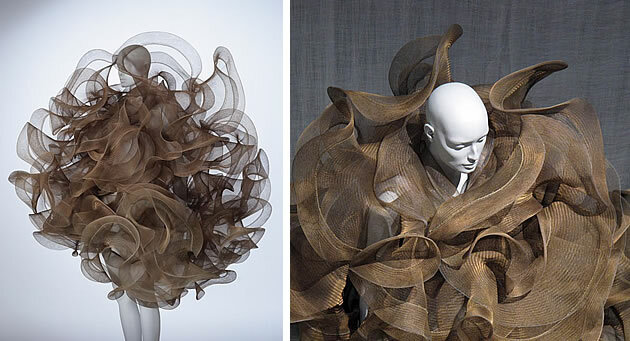 Photographs of a wearable art piece by Koji Tatsuno. For my Armoury project I began looking at metal suits and observed how panels were built up in layers and how the composition of the suit featured strong shapes and lines. This led me to look at Robert Delaunay and Marcel Duchamp’s cubist paintings. They exuded vibrant blocks of colour and colliding fragmented shapes that became an almost abstract pattern. I developed the idea of a deconstructed armoury along with the patterns from the eastern shields I had seen. The designs of Hussein Chalayan were extremely inspiring to this work. The way in which he draped the fabrics, with their extremely embellished surfaces, felt very protective and he toyed with the concept of lighter layers being tied and joined to become a chunkier form around the body. As I researched my project on Metamorphosis and Collecting I was fascinated by a Malaysian designer, who I discovered online, Ding Yong. Yong’s Metamorphosis collection is visually arresting and alluring. Yong addresses the idea of cocooning, with a sinister edge. Tartan prints shroud and restrain the body, challenging the idea of form and function, as the form beneath is immobilised. Through the designs, Yong creates a feeling of sheltering and suppression within a single body. Designs from Ding Yong’s Metamorphosis collection. As I began to consider the idea of installation for my Textiles project, the work of Yayoi Kusama and Song Dong in his Waste Not installation were very alluring to me. Both express ideas of repetition, obsession and excess. I was fortunate to be able to see the work of both first-hand and the experience of viewing their work was significant. The pieces were entirely immersive; the scale and the way the space was addressed created a suppressive and consuming atmosphere for all. This resonating impact affected my work extensively as I took my textile samples and looked to construct an installation of my own. What advice do you have for other high school Art students who wish to gain excellent grades in a Textiles project? Halima: For me it was always more about personal attainment and whether the work conveyed what I needed it to. I have found it is better to become so involved in the work and process that the grade comes as a secondary result. Exploring something in your work that you are genuinely interested in – or that fascinates you – allows the work to come more easily and organically. When you are pushing for ideas and it becomes a chore, this shows through in what you make. Within A Level Textiles I would say that it is crucial to show lots of experimentation, processes and ideas, but then be able to reflect on the work and isolate the most successful elements to be pushed forward. Try not to think of the end results at the beginning of the project – allow yourself to be guided and these changes will make for a more exciting final piece. By having a concrete idea of what the work should be you can close yourself off from truly experimenting and learning. Being able to demonstrate different techniques and skills is also important. For example, it is okay to have something appear messy or raw if this is justified for your purpose and you have shown you are capable of doing it in other, possibly more refined ways. It is often exciting to show contrasts and juxtaposition of different processes in a textile work. Reflect on work with peers: often they will have the most interesting things to say. Even if they do not understand what you had intended for the work to be about, as creative individuals they can suggest something to research further and develop within your work. Be active. Work cannot always be made glued to a chair at a desk; the most exciting things happen when you take a chance and try something. The main piece of advice I would give would be to embrace all means of creative expression and not be afraid to challenge or blur the boundaries. A Level Textiles is an extremely open subject and if you embrace the creative process, you may discover something unexpected of your work and yourself as a maker. This series of photographs show the captivating, luminous quality of Halima’s outstanding final A Level Textiles piece. Amazing! Did you enjoy this article? Please share it using the social media buttons below!